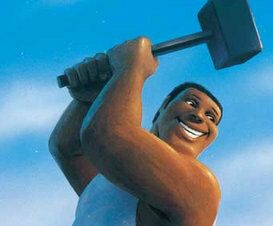 This is a larger-than-life tale about the African American hero who was born with a hammer in his hand. Join John Henry on a scenic journey from cotton country to the wilderness, where he finds men of all colors working together to build a great railroad. In no time, John Henry becomes king of the railroad camps by driving more steel than any man alive. And, in an exciting contest that pits man against machine, he single-handedly out-performs a new-fangled steam drill. This rousing tale delivers an inspirational message about pride and perseverance. Themes: Stories from the African-American Tradition, Westward Ho!